The potential uses of dexmedetomidine (DEX), a highly selective α2 - adrenoceptor agonist are very diverse. DEX appears to mimic many of the actions of mythical 'ideal' sedative/analgesic agent. Although not orally active, DEX shows good bioavailability when administered via various other routes like intranasal, buccal, IM than intra-venous. DEX has similar pharmacokinetics in all age groups. Its side effects are predictable and easily treatable, hence it has found place as a part of fast-tracking anesthesia regimens in children. DEX is the sedative of choice for peri-operative use in high risk patients, since it is cardioprotective, neuroprotective and renoprotective. Premedication with DEX obtunds the autonomic pressor responses due to laryngoscopy and endotracheal intubation when used as an adjuvant to general anesthesia. DEX in high doses offers another approach to managing morbidly obese patients and patients with a compromised airway; without causing any cardio-respiratory depression. It is near ideal hypotensive agent used for controlled hypotension. Its value as a primary sedative and analgesic is becoming more accepted and evident in critically ill patients; in adult and paediatric intensive care units. Besides use in locoregional anesthesia, it is also used as an opioid substitute, for treatment of substance withdrawal, as an anti-shivering agent, for treatment of delirium and as an end of life medication. Availability of an antidote (Atipamezole) with similar elimination half life is taking the drug into new frontiers. However, use of DEX is contraindicated in patients with hepatic failure, hypovolemic shock, advanced heart block or ventricular dysfunction. Dexmedetomidine a second generation a 2 adrenergic receptor specific, pharmacologically active d- isomer of medetomidine was first synthesized in late 1980's. DEX appears to mimic many of the actions of mythical 'ideal' sedative/analgesic agent with its wide spectrum of actions encompassing the entire peri-operative period and then beyond that, into the critical care services. The food and drug administration (FDA) approved the use of DEX as an ICU sedative in 1999 and its use for nonintubated patients adult and pediatric, requiring sedation prior to and/or during surgical and other procedures in 2008. DEX has been growing in popularity and expanding its role in anesthesia since then. 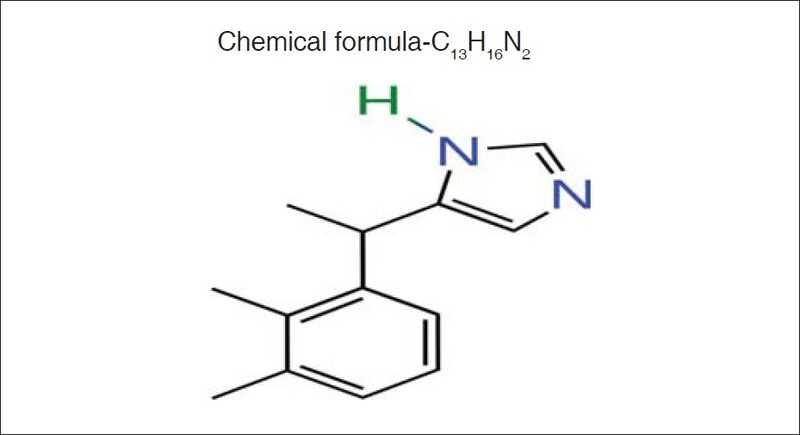 Chemical formula-C13H16N2 IUPAC name: 4-[(1S)-1-(2,3-dimethylphenyl)ethyl]-1H-imidazole. DEX is a small molecule containing imidazole ring. The supra-spinal level of analgesia and sedation may be due to modulation of descending noradrenergic pathway originating in the main noradrenergic nucleus/center locus coeruleus. This supraspinal action could explain the prolongation of spinal analgesia after intravenous administration of DEX. The spinal level of antinociceptive action seems to be through the substantia gelatinosa (Lamina II of Rexed in grey matter of spinal cord). It closes the gate at the dorsal horn to stimuli coming from peripheral Aδ and C fibers and also inhibits release of nociceptive humoral transmitters like substance P. It produces hyper polarization of cell membrane. 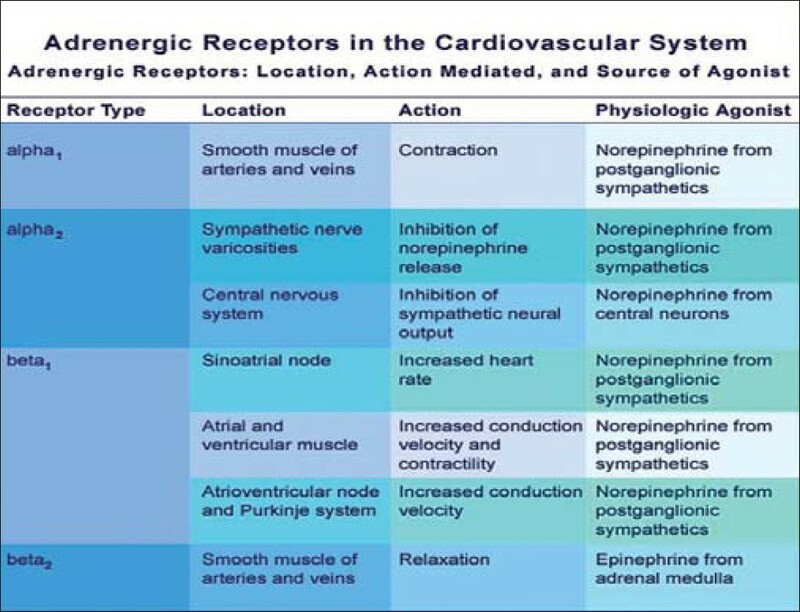 These mechanisms effectively suppress, both neuronal firing, as well as, release of neurotransmitter noradrenaline at the nerve terminals. This antinociceptive effect may explain the prolongation of the sensory block when added to spinal anesthetics. It is observed that DEX does not alter the sweating threshold; there is a dose dependent decrease in the vasoconstriction and shivering thresholds. , Alpha-2 adrenergic agonists decrease the thermo sensitivity at spinal and supraspinal sites by suppressing the neuronal conductance. In clinical doses, DEX also exhibits decongestant, antisialagogue, antishivering, antiemetic effects. ,,, Other claimed advantages include minimal respiratory depression with cardioprotection, neuroprotection and renoprotection, thus making it useful at various situations including offsite procedures. Intravenous infusion of DEX is commonly initiated with a 1 μg /kg loading dose, administered over 10 min, followed by a maintenance infusion of 0.2-1.0 μg /kg/h. Limiting its usefulness is the caution that the drug cannot be given as a bolus due to concerns about peripheral alpha-2B receptor stimulation with resulting hypertension. DEX when used as adjunct to GA, attenuates stress response to tracheal intubation/extubation. , Optimal dose for attenuating pressor response seems to be 1 μg /kg with lesser doses not being effective. The analgesic-sparing effect observed after a preoperative or an intraoperative administration of DEX usually lasts up to 24 h,  which can be used to advantage in situations where high anesthetic concentration is either undesirable or not tolerated. 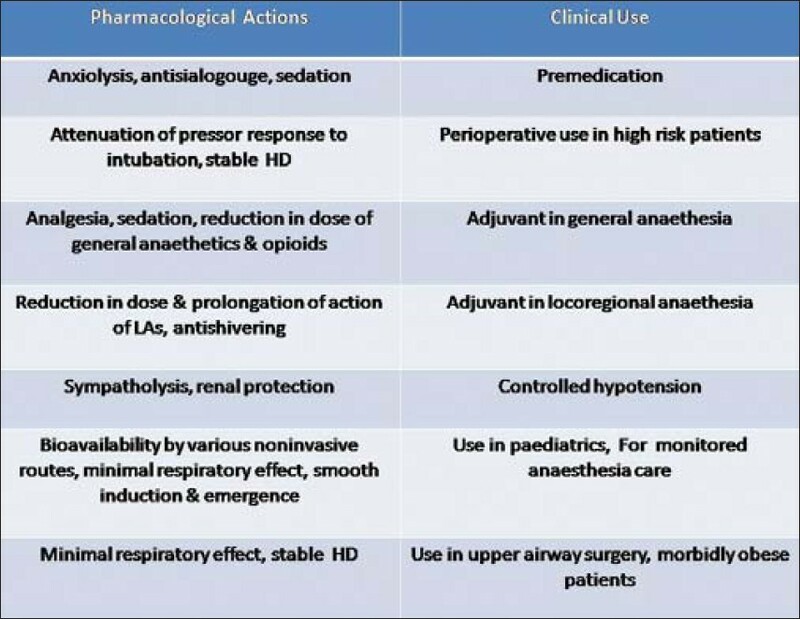 As an adjuvant to GA- DEX potentiates the anesthetic effects of all intraoperative anesthetics regardless of method of administration (intravenous, volatile or regional block). ,,, As an adjuvant to general anesthesia it has minimum alveolar concentration (MAC) reducing  and opiate sparing ,, properties, which helps in decreasing the inhalational anesthetics, IV anesthetics and opioid requirements by up to 90%. DEX has a strong synergistic effect with other sedatives as well. Controlled hypotension- It is evident from the literature that DEX is equally effective to remifentanil , and esmolol  in controlled hypotension application during tympanoplasty. The parameters assessed were intraoperative bleeding, preoperative hemodynamics, lactate levels, recovery and adverse effects. Researchers have found that 3 μg DEX and 30 μg clonidine are equipotent intrathecally. The addition of 5 μg of intrathecal DEX prolonged the post-operative analgesic effect of ropivacaine by 8 h.  Increasing the dose > 10 μg for prolonged surgeries like total hip or total knee needs further RCTs. The dose of clonidine is 1.5 to 2 times higher than DEX when used in epidural route. Recommended dose of DEX as an adjunct for EA is 1.5-2 μg /kg. Results of recent RCTs on post-operative patients who underwent general  and epidural  anesthesia showed lower incidence in post-operative shivering in DEX group. A large body of recent work in India supports its favorable profile in improving peri-operative outcome in general and locoregional anaesthesia. ,,,,,, Few researchers have recommended it as the best choice as the primary sedative in adult and paediatric ICU, for short term, as well as long term use. , The availability of low dose ampoules (50μg/ml) can be the step ahead towards affordability in developing countries like India. Patients with hepatic dysfunction may require a lower dose of DEX than healthy subjects to achieve a similar response, given the extensive hepatic metabolism of DEX. As such, caution should be exercised when coadministering DEX with other sedatives, analgesics, vasodilators, or other negative chronotropic medications. DEX is not recommended for microvascular free flap procedures, as α2 agonists may cause direct vasoconstriction and reduction in flap blood flow. For the same reason, its use in neurovascular patients or those considered at high risk of vasospasm is not recommended. It is not indicated in recent acute epilepsy or uncontrolled seizure activity. 1. Shukry M, Miller JA. Update on dexmedetomidine: Use in nonintubated patients requiring sedation for surgical procedures. Ther Clin Risk Manag 2010;6:111-21. 3. Philipp M, Brede M, Hein L. Physiological significance of alpha(2)-adrenergic receptor subtype diversity: one receptor is not enough. Am J Physiol Regul Integr Comp Physiol 2002;283:R287-95. 4. Lam SW, Alexander E, Sulsa GM. DRUG UPDATE: Dexmedetomidine Use in Critical Care; AACN Advanced Critical Care 2008;19:113-20. 5. Gertler R, Brown HC, Mitchell DH, Silvius E. Dexmedetomidine: a novel sedative-analgesic agent. Proc (Bayl Univ Med Cent) 2001;14:13-21. 6. Candiotti KA, Bergese SD, Bokesch PM, Feldman MA, Wisemandle W, Bekker AY. Monitored Anesthesia Care with Dexmedetomidine: A Prospective, Randomized, Double-Blind, Multicenter Trial. Anesth Analg 2010;110:47-56. 7. Gupta R, Bogra J, Verma R, Kohli M, Kushwaha J, Kumar S. Dexmedetomidine as an intrathecal adjuvant for postoperative analgesia. Indian J Anaesth 2011;55:347-51. 9. Yazbek-Karam VG, Aouad MM. Perioperative uses of dexmeditomidine. MEJ Anaesth 2006;18:1043-56. 10. Farag E, Argalious M, Sessler DI, Kurz A, Ebrahim ZY, Schubert A. 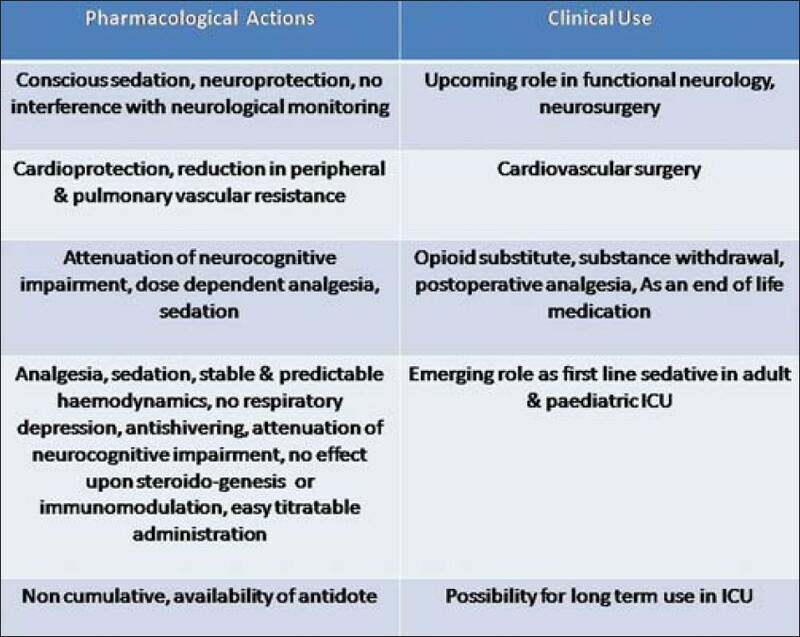 Use of a2-Agonists in Neuroanesthesia: An Overview. Ochsner J 2011;11:57-69. 11. Guo TZ, Buttermann AE, Jiang JY, Maze M. Dexmedetomidine injection into the locus ceruleus produces antinociception. Anesthesiology 1996;84:873-81. 12. Jaakola ML, Salonen M, Lehtinen R, Scheinin H. The analgesic action of dexmedetomidine - a novel á2 -adrenoceptor agonist- in healthy volunteers. Pain 1991;46:281-5. 13. Ebert TJ, Hall JE, Barney JA, Uhrich TD, Colinco MD. The effects of increasing plasma concentrations of dexmedetomidine in humans. Anesthesiology 2000;93:382-94. 14. Shehabi Y, Botha JA, Ernest D, Freebairn RC, Reade M, Roberts BL, et al. Clinical application, the use of dexmedetomidine in intensive care sedation. Crit Care Shock 2010;13:40-50. 15. Bergese SD, Candiotti KA, Bokesch PM, Zura A, Wisemandle W, Bekker AY. AWAKE Study Group. A Phase IIIb, randomized, double-blind, placebo-controlled, multicenter study evaluating the safety and efficacy of dexmedetomidine for sedation during awake fiberoptic intubation. Am J Ther 2010;17:586-95. 16. Housmans PR. Effects of dexmedetomidine on contractility, relaxation, and intracellular calcium transients of isolated ventricular myocardium. Anesthesiology 1990;73:919-22. 17. Talke P, Tayefeh F, Sessler DI, Jeffrey R, Noursalehi M, Richardson C. Dexmedetomidine does not alter the sweating threshold, but comparably and linearly decreases the vasoconstriction and shivering thresholds. Anesthesiology 1997;87:835-41. 18. Dyck JB, Maze M, Haack C, Vuorilehto L, Shafer SL. The pharmacokinetics and hemodynamic effects of intravenous and intramuscular dexmedetomidine hydrochloride in adult human volunteers. Anesthesiology 1993;78:813-20. 19. Yuen VM, Hui TW, Irwin MG, Yuen MK. A Comparison of Intranasal Dexmedetomidine and Oral Midazolam for Premedication in Pediatric Anesthesia. Anesth Analg 2008;106:1715-21. 20. Venn RM, Karol MD, Grounds RM. Pharmacokinetics of dexmedetomidine infusions for sedation of postoperative patients requiring intensive care. Br J Anaesth 2002;88:669-75. 21. Aho M, Erkola O, Kallio A, Scheinin H, Korttila K. Comparison of dexmedetomidine and midazolam sedation and antagonism of dexmedetomidine with atipamezole. J Clin Anesth 1993;5:194-203. 22. Karhuvaara S, Kallio A, Salonen M, Tuominen J, Scheinin M. Rapid reversal of alpha 2-adrenoceptor agonist effects by atipamezole in human volunteers. Br J Clin Pharmacol 1991;31:160-5. 23. Scheinin H, Aantaa R, Anttila M, Hakola P, Helminen A, Karhuvaara S. Reversal of the sedative and sympatholytic effects of dexmedetomidine with a specific alpha2-adrenoceptor antagonist atipamezole: A pharmacodynamic and kinetic study in healthy volunteers. Anesthesiology 1998;89:574-84. 24. Keniya VM, Ladi S, Naphade R. Dexmedetomidine attenuates sympathoadrenal response to tracheal intubation and reduces perioperative anaesthetic requirement. Indian J Anaesth 2011;55:352-7. 25. Grosu I, Lavand'homme P. Use of dexmedetomidine for pain control. F1000 Med Rep 2010;2:90. 26. Venn RM, Grounds RM. Comparison between dexmedetomidine and propofol for sedation in the intensive care unit: patient and clinician perceptions. Br J Anaesth 2001;87:684-90. 27. Aantaa R, Kanto J, Scheinin M, Kallio A, Scheinin H. Dexmedetomidine, an alpha 2- adrenoceptor agonist, reduces anesthetic requirements for patients undergoing minor gynecologic surgery. Anesthesiology 1990;73:230-5. 28. Memiþ D, Turan A, Karamanlýoðlu B, Seker S, Pamukcu Z. Dexmedetomidine reduces rocuronium dose requirement in sevoflurane anaesthesia. Curr Anaesth Crit care 2008;19:169-74. 29. Arain SR, Ruehlow RM, Uhrich TD. The efficacy of dexmedetomidine versus morphine for postoperative analgesia after major inpatient surgery. Anesth Analg 2004;98:153-8. 30. Grewal A. Dexmedetomidine: New avenues. J Anaesthesiol Clin Pharmacol 2011;27:297-302. 31. Talke P, Li J, Jain U, Leung J, Drasner K, Hollenberg M, et al. Effects of perioperative dexmedetomidine infusion in patients undergoing vascular surgery. The Study of Perioperative Ischemia Research Group. Anesthesiology 1995;82:620-33. 32. Ramsay MA. Tracheal resection in the morbidly obese patient: The role of dexmedetomidine. J Clin Anesth 2006;18:452-54. 33. Ankichetty S, Wong J, Chung F. A systematic review of the effects of sedatives and anaesthetics in patients with obstructive sleep apnoea. J Anaesth Clin Pharmacol 2011;27:447-57. 34. Wong AY, Cheung CW. Dexmedetomidine for resection of a large phaeochromocytoma with invasion into the inferior vena cava. Br J Anaesth 2004; 93:873. 35. Bryskin R, Weldon BC. Dexmedetomidine and magnesium sulfate in the perioperative management of a child undergoing laparoscopic resection of bilateral pheochromocytomas. J Clin Anesth 2010;22:126-9. 36. Hudcova J, Schumann R. Undiagnosed catecholamine-secreting paraganglioma and coexisting carcinoid in a patient with MH susceptibility: an unusual anesthetic challenge. J Anesth 2007; 21:80-82. 37. Turan G, Dincer E, Ozgultekin A, Uslu C, Ormanci F, Akgun N. Comparison of dexmedetomidine, remifentanil and esmolol in controlled hypotensive anaesthesia. The Internet J Anesthesiol 2008;17, DOI: 10.5580/1a87. 38. Richa F, Yazigi A, Sleilaty G, Yazbeck P. Comparison between dexmedetomidine and remifentanil for controlled hypotension during tympanoplasty. Eur J Anaesthesiol 2008;25:369-74. 39. Maroof M. Evaluation of effect of dexmedetomedine in reducing shivering following epidural anesthesia. ASA annual meeting. Abstract: A49. 40. Gupta R, Verma R, Bogra J, Kohli M, Raman R, Kushwaha JK. A comparative study of intrathecal dexmeditomidine and fentanyl as adjuvants to bupivacaine. J Anaesthesiol Clin Pharmacol 2011;27:339-43. 41. Shukla D, Verma A, Agarwal A, Pandey HD, Chitra Tyagi C. Comparative study of intrathecal dexmeditomidine with intrathecal magnesium sulfate used as adjuvants to bupivacaine; J Anaesthesiol Clin Pharmacol 2011;27:495-9. 42. Anand VG, Kannan M, Thavamani A, Bridgit MJ. Effects of dexmedetomidine added to caudal ropivacaine in paediatric lower abdominal surgeries. Indian J Anaesth 2011;55:340-6. 43. Kanazi GE, Aouad MT, Jabbour-Khoury SI, Al Jazzar MD, Alameddine MM, Al-Yaman R, et al. Effect of low-dose dexmedetomedine or clonidine on the characteristics of bupivacaine spinal block. Acta Anaesthesiol Scand 2006;50:222-7. 44. Tekin M, Ismail Kati I, Tomak Y, Erol Kisli E. Effect of Dexmedetomidine IV on the Duration of Spinal Anesthesia with Prilocaine: A Double-Blind, Prospective Study in Adult Surgical Patients. Cur The Res 2007; 68:313-24. 45. Memis D, Turan A, Karamanlýoglu B, Pamukçu Z, Kurt I. Adding Dexmedetomidine to Lidocaine for Intravenous Regional Anesthesia. Anesth Analg 2004;98:835-40. 46. Al-Metwalli RR, Mowafi HA, Ismail SA, Siddiqui AK, Al-Ghamdi AM, Shafi MA, et al. Effect of intra-articular dexmedetomidine on postoperative analgesia after arthroscopic knee surgery. Br J Anaesth 2008;101:395-9. 47. Flacke JW. 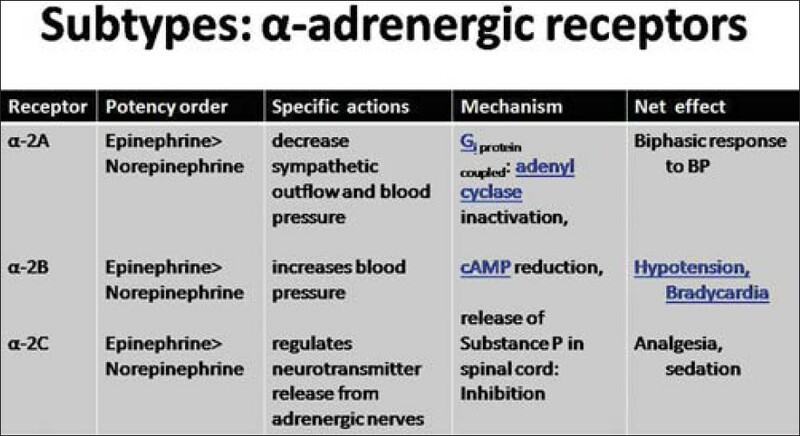 Alpha 2-adrenergic agonists in cardiovascular anesthesia. J Cardiothorac Vasc Anesth 1992;6:344-59. 48. Snapir A, Posti J, Kentala E, Koskenvuo J, Sundell J, Tuunanen H, et al. Effects of low and high plasma concentrations of dexmedetomidine on myocardial perfusion and cardiac function in healthy male subjects. Anesthesiology 2006;105:902-10. 49. Leino K, Hynynen M, Jalonen J, Salmenperä M, Scheinin H, Aantaa R. Renal effects of dexmedetomidine during coronary artery bypass surgery. BMC Anesthesiology 2011;11:9. 50. Bekker AY, Kaufman B, Samir H, Doyle W. The Use of Dexmedetomidine Infusion for Awake Craniotomy. Anesth Analg 2001;92:1251-3. 51. Maksimow A, Snapir A, Sarkela M, Kentala E, Koskenvuo J, Posti J, et al. Assessing the depth of dexmedetomidine-induced sedation with electroencephalogram (EEG)-based spectral entropy. Acta Anaesthesiol Scand 2007;51:22-30. 52. Anschel DJ, Aherne A, Soto RG, Carrion W, Hoegerl C, Nori P, et al. Successful intraoperative spinal cord monitoring during scoliosis surgery using a total intravenous anesthetic regimen including dexmedetomidine. J Clin Neurophysiol 2008;25:56-61. 53. Hoy SM, Keating GM. Dexmedetomidine: A Review of its Use for Sedation in Mechanically Ventilated Patients in an Intensive Care Setting and for Procedural Sedation. Drugs 2011;71:1481-1501. 54. Mowafi HA, Aldossary N, Ismail SA, Alqahtani J. Effect of dexmedetomidine premedication on the intraocular pressure changes after succinylcholine and intubation. Br J Anaesth 2008;100:485-9. 55. Chrysostomou C, Schmitt CG. Dexmedetomidine: Sedation, analgesia and beyond. Expert Opin Drug Metab Toxicol 2008;4:619-27. 56. Kaygusuz K, Gokce G, Gursoy S, Ayan S, Mimaroglu C, Gultekin Y. A comparison of sedation with dexmedetomidine or propofol during shockwave lithotripsy: A randomized controlled trial. Anesth Analg 2008;106:114-9. 57. Memiþ D, Hekimoðlu S, Vatan I, Yandým T, Yüksel M, Süt N. Effects of midazolam and dexmedetomidine on inflammatory responses and gastric intramucosal pH to sepsis, in critically ill patients. Br J Anaesth 2007;98:550-2. 58. Jaakola ML. 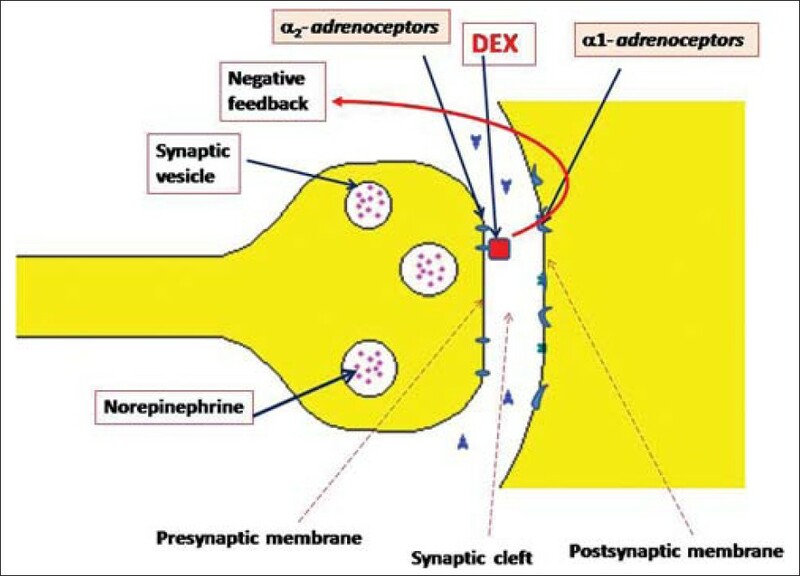 Dexmedetomidine as a preanaesthetic agent - Phase I-III studies with a novel, specific 2 -adrenoceptor agonist. Acta Anaesthesiol Scand 1998;42:276-7. 59. Riker RR, Shehabi Y, Bokesch PM, Ceraso D, Wisemandle W, Koura F, et al. Dexmedetomidine vs Midazolam for Sedation of Critically Ill Patients. JAMA 2009;301:489-99. 60. Levanen J, Makela ML, Scheinin H. Dexmedetomedine Premedication Attenuates Ketamine -induced Cardiostimulatory Effects and Postanesthetic Delirium. Anesthesiology 1995;82:1117-25. 61. Bajwa SJ, Gupta S, Kaur J, Singh A, Parmar SS. Reduction in the incidence of shivering with perioperative dexmedetomidine: A randomized prospective study. J Anaesth Clin Pharmacol 2012;28:86-91. 62. Roberts SB, Wozencraft CP, Coyne PJ, Smith TJ. Dexmedetomidine as an adjuvant analgesic for intractable cancer pain. J Palliat Med 2011;14:371-3. 63. Tobias JD, Berkenbosch JW. Initial experience with dexmedetomidine in paediatric-aged patients. Paediatr Anaesth 2002; 12:171-5. 64. Finkel JC, Elrefai A. The Use of Dexmedetomidine to Facilitate Opioid and Benzodiazepine Detoxification in an Infant. Anesth Analg 2004;98:1658-9. 65. Siddappa R, Riggins J, Kariyanna S, Calkins P, Rotta AT. High-dose dexmedetomidine sedation for pediatric MRI. Paediatr Anaesth 2011;21:153-8. 66. Mason KP, Lubisch NB, Robinson F, Roskos R. Intramuscular Dexmedetomidine Sedation for Pediatric MRI and CT. Am J Roentgen 2011; 197:720-5. 67. Al Zaben K, Qudaisat I, Al Barazangi B, Badran I. Use of Dexmeditomedine as the main anesthetic agent in patients with laryngo-tracheomalacia. Middle East J Anesthesiol 2010;20:603-6. 68. Abu-Halaweh SA, Al Oweidi AK, Abu-Malooh H, Zabalawi M, Alkazaleh F, Abu-Ali H, et al. Intravenous dexmedetomidine infusion for labour analgesia in patient with preeclampsia. Eur J Anaesthesiol 2009;26:86-7.